ahh man this is looking so good already. The eyelashes are awesome and the face is looking really good so far. This is motivating. Wow @phungdinhdung Way to have a nice high set bar. Good job! Keep it up. It's nice that you are taking the time with your concept so it rocks. Really like the colour choices. Good luck! Thanks everyone for the comments really keep me motivated working on this one. 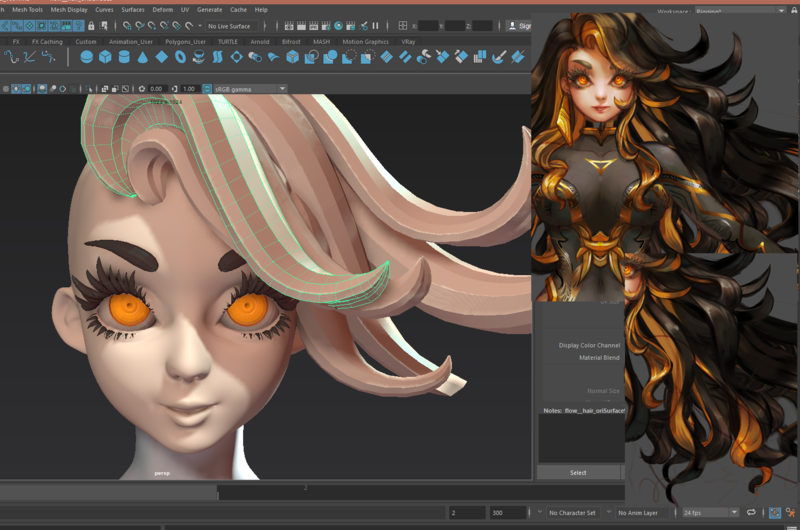 I ve been struggling with modeling her twisting long hairs tonight, hopefully I can figure it out by the first day of new year, tomorrow :P.
So far it's looking really good. It's really matching up with you concept really well. I can see why it would be a struggle. There's so much hair.. .. But at the end I know it'll be awesome. Wow definitely going to follow this piece of yours, looking very cool so far, both 2d and 3d wise! Great start on that 3d model to! Thanks everyone for the comments ! it really keep me working hard on this project ! 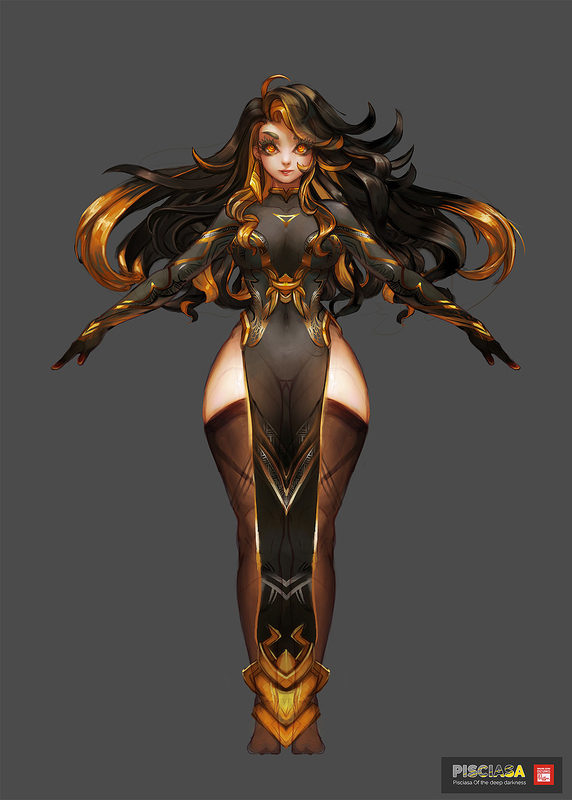 I am working on modeling Pisciasa base mesh and hair model atm , so havent got any major update yet, but just realize that I havent upload the 2D model sheet I made for her so here she is. 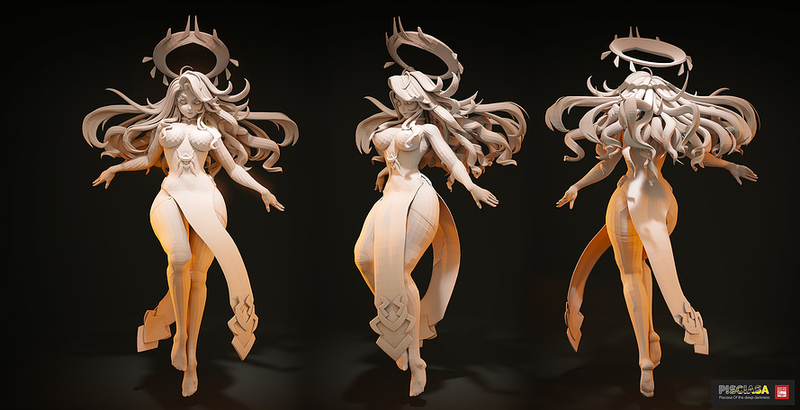 The reason I have to take extra step to make this sheet is that I tried to model without model / sculpt sorely base on Concept in some of my past projects but then I fail terribly capturing the proportion and feeling of the 2D concept . Sometime I feel it's way more easier to adjust shape & proportion in 2D medium rather than in 3D like modeling / sculpting. Ah , right and the fishy . Quickly made this so I dont need to blind-guess sculpting too much in Zbrush later. some bonus views :P. well.......that help with the model too....so ... yeah. I am almost done with the hair now, gotta update later tonight XD ! I look forward to it. I do believe doing a model sheet can be very helpful, specially when it comes to adjusting shapes and proportions like you said. I'm still new to doing 3D, so I think its a great tip/ step to do. The mecha fish looks awesome. I really wonder how'll it'll look in 3D. 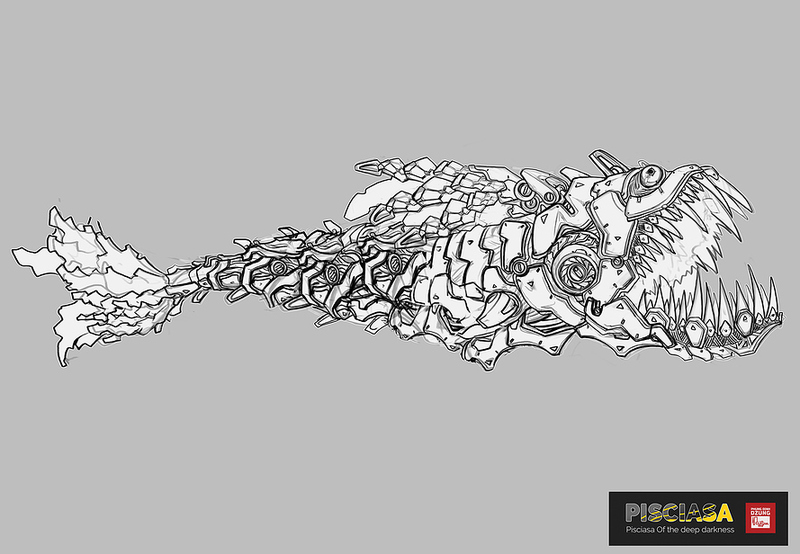 This is deformation & articular joint test of my base mesh for Pisciasa. Did several quick test using default Voxel skinning at 128 res, no manual weight painting just yet. I move back & forth several time to find the best optimal combination of topology flow and articular joints position to maximize linear-blending skinning results. The colored lines of the model are just aid my process of specify the topology of the model, red line indicate the most important loop, Orange is less important but a should-have if tris-count allowed, Black line is the middle lines to separated model in half or quarter that will help with the UV seam later. Better result will be able to achieve by the further use of weight paint fixing and corrective blendshapes . I wasn't expecting an awesome tutorial/tip to come with the update. You really captured the proportions of your character really well. When I do my retopo I'll be looking at this again. Wish there were more shots of the hair because it looks amazing. Keep going man. Top notch. Design, topology, color, story, everything. Thank you everyone for your kind comments ! 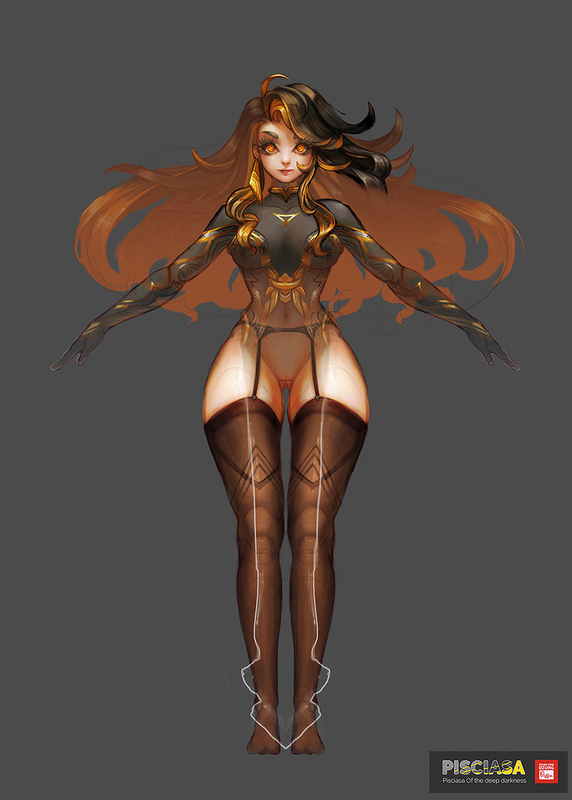 Here 's what I have so far for Pisciasa model, I can quite say that the modeling for the girl is done, I will definitely need some more polishing here and there on the model while I am working on the texture later ( like adding more micro hair strands, facial features or clothes folds etc ) . But yeah, time is running out so I gotta move on to the fishy next. All the hairs are modelled raw and purely in Maya using traditional polygon modeling . I tried with Zbrush at first then I failed miserably , I can't really control the curvature and shape/ twisting sides of the hair clumps perfectly in Zbrush ( by perfect I mean to match with the concept ) these are the closest I can get, If I have more time I will come back and put more time in to detailing the hair model a bit more. my favorite work so far, can't wait to see more! This is looking fantastic. I wish I knew how to make amazing hair like this. I need to up my maya skills. I can't wait to see the textures on this girls. So far so good.